As the temperature drops below -40 again it makes you wonder what you are doing here. Isn't there any other place you could have gone? And once again we managed to almost run out of water at these temperatures. The propane is running low too, or just not running at all, who knows. As the title say, I guess I am born to endure this kind of weather we have here. The Swedish girl duo First Aid Kit sings this in their hit song "Emmylou" which you all should go and discover. W wonders how I can not get depressed here. Sure, the darkness gets to me too sometimes, but probably not as hard as on him, or someone from say Texas. The landscape is still beautiful in these low temperatures, as always. I am so amazed by the ravens, they are pretty tolerant to this weather it seems. I don't know how they survive. I also don't understand how they can have enough energy to even fly in these low temperatures. Yesterday I went to work and happen to see the reflection of the sun in the building opposite to mine, and I got this "need" to go and take pictures. Sometimes the light is just right, and the icefog gives the whole landscape a kind of mysterious veil. 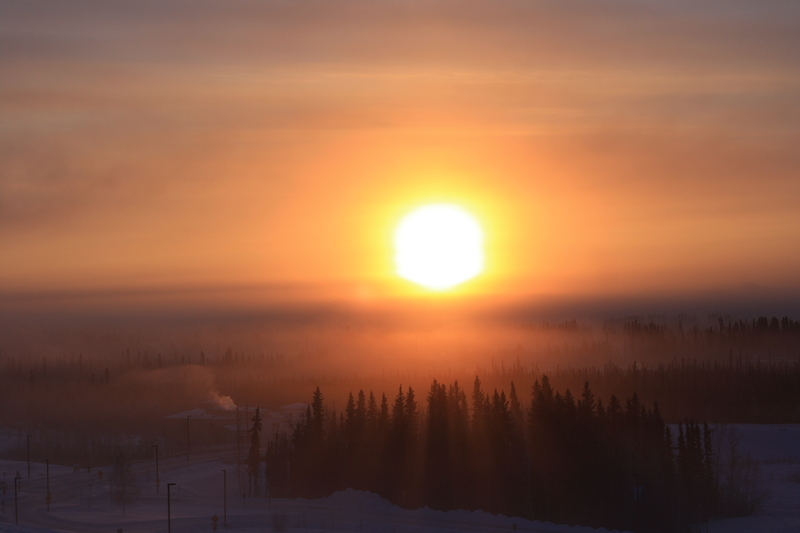 Sun, Spruce, Icefog, I love it. Not all the time, but sometimes. The sun is an amazing source of energy. Not only actual but mental energy. Everyone who lives somewhere where it is dark during a long time of the year probably knows what I mean. We tend to get happier this time of the year. We have snow on average 7 months of the year. That usually mean temperature below freezing for at least 6 months of the year. Darkness is such a central part of the life here. But as soon as spring hits, we all forgotten about it. Cold weather do not come for free. With the inversion the cold air gets trapped, together with the pollution. Air quality here is seriously considered unhealthy. And every day on the radio when temperatures get down to around -40 they tell you: elderly people, children and people with respiratory problems should stay inside. The mountains too will make an appearance every now and then. And when the sun is just about right you get this silhouette of the mountains, it is beautiful. The other weekend we got a visitor at our house, a moose stepped on the porch. He was probably searching for some food. You know that pumpkin I wrote about around halloween, my very first carved pumpkin? You know, the one I said would last til the summertime or until a moose eats it. Well, this moose (or a moose) actually ate my beautiful carved pumpkin. Usually we appreciate January, cause it mean the start of the spring (well you know technically the spring starts in like April) but we gain a lot of daylight everyday now. Last week I even went skiing, it was pretty warm for once. The trails were just groomed, and it was a beautiful weather, and the sun is creating beautiful patterns in the snow. And the weather has created a birch arch over the ski trails. And, this is what keeps me happy during the wintertime. Obviously I can't ski right now, with these temperatures, but they say the temperature is going to get warmer next week. I am looking forward to it. This is prime time to bake, and the other weekend me and W made some food for the Football game, we made sliders and I made the buns. They were so good! But now it's too cold/we are out of propane, so no baking. Have a nice week and stay warm. Posted on January 27, 2013 by Ann Rumbleinthearctic and filed under Alaska, Photography, The great wide open, Baking, Cabin Life and tagged Alaska Baking Outdoors Ski Skiing Winter Winter Adventures 2013_2 Adventure Cabin Life Snow Nature.